Parts of the banjo neck. 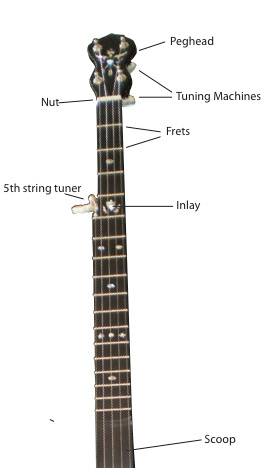 The banjo neck has four main parts, the neck itself, the heel, the fingerboard, and the peghead, each of which have features of their own. The neck itself acts as a handle. The noting hand slides up or down it in order to reach different notes. The shape and size of the neck is important. Strength is a consideration with the neck. The strings will exert constant tension on the neck throughout the life of the banjo. The neck must be strong enough to remain straight. It is a good idea to reinforce the neck. I use a steel bar to reinforce my necks, the details are discussed in the Neck section. The back of the banjo neck, where the palm and heel of the hand hold or move along it is shaped with the hand in mind. I like a gentle V shape, because it suits my hand nicely and gives the thumb of my noting hand something to push against. The shape of the neck also contributes to the weight of the neck. I like for the neck to be as thin as possible while still providing an ample handle. The heel is the part of the banjo neck that meets the rim. The heel must be strong. The end of the heel that meets the rim will be given a radius that matches the diameter of the rim. The banjo neck will be mounted to the rim at a slight angle, this means that the mating surface of the heel has both a radius and an angle cut into it. The heel also acts as a place for the dowel stick to mount into and must have a hole drilled into the surface that mates with the rim to accommodate the tenon of the dowel stick. This is a feature that will be addressed in the neck section. The peghead serves as a place for the tuning machines to mount. It too must be strong. The peghead angles back from the plane of the fingerboard. Take some extra consideration of the grain orientation in this area when planning as this tends to be the weakest and most vulnerable part of many stringed instruments. The fingerboard is the front side of the banjo neck and acts as the playing surface for the noting hand. Some banjos are fretted and some have no frets. In either case the fingerboard must be wide enough to accommodate the fingers. Here is something to think about: if the rim is 11″ or 12″ in diameter and the scale length is 25.5″ from nut to bridge, how long should the neck be? That depends on where you want the bridge to rest on the head. Subtract; (Rim Size) – (Distance of bridge from tail) = Distance from bridge to beginning of fingerboard. Subtract; (Scale Length) – (Distance from Bridge to beginning of fingerboard) = length of fingerboard. Draw some pictures to help yourself figure this out the first time. With a 25.5″ Scale length, my fingerboard for a 12″ rim comes out to about 19″. And for an 11″ rim, about 19.5″. Knowing the length of the fingerboard we can now consider the total length of the neck. In addition to the length of the fingerboard the total neck length also includes the length of the peghead. So, if we add 7″ to the fingerboard length to accommodate the length of the peghead that gives a total length of 26.5″. For an 11″ rim make the banjo neck 1/2″ longer.